For other uses, see Camargue (disambiguation). Operation Camargue was one of the largest operations by the French Far East Expeditionary Corps and Vietnamese National Army in the First Indochina War. It took place from 28 July until 10 August 1953. French armored platoons, airborne units and troops delivered by landing craft to the coast of central Annam, modern-day Vietnam, attempted to sweep forces of the communist Viet Minh from the critical Route One. 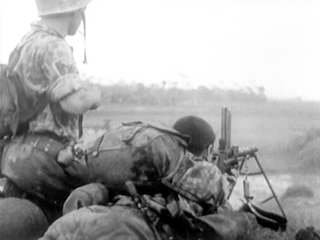 French soldiers fight off a Viet Minh ambush in 1952. The ambushes cost the French nearly 400 armoured vehicles between 1952 and 1954. ... ten infantry regiments, two airborne battalions, the bulk of three armored regiments, one squadron of armored launches and one armored train, four artillery battalions, thirty four transport aircraft, six reconnaissance aircraft and twenty two fighter bombers, and about twelve Navy ships, including three LST's—this force was not inferior in size to some of those used in landing operations in World War II in the Pacific. – Bernard Fall, Street Without Joy, 1961. Page 144. LVT-4s like these ferried French troops during Operation Camargue. 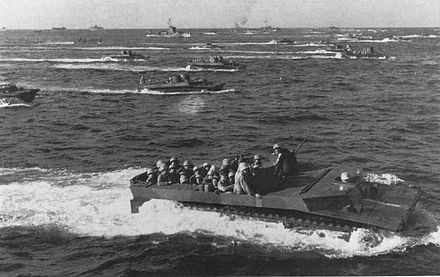 Here, LVT-4s are pictured carrying American marines to the beaches of Iwo Jima. Pro-French Vietnamese soldiers, like these shown here treating a Viet Minh prisoner, formed part of the French landing forces in Operation Camargue. M24-Chaffee tanks accompanied the French in Operation Camargue. Though they have a top speed of 25 mph (40 km/h) off-road, the French found progress particularly slow in the boggy landscape inland of Route One. The Moroccan infantry took the lead, and the French commanders sealed themselves in their tank turrets and advanced behind. Viet Minh forces, which were waiting in ambush, fired almost the same instant as the lead Moroccan units who noticed their presence. The Moroccan forces spread out into the surrounding rice paddies, and the bazookas of the Viet Minh missed the French tanks. The French commander called in Piroth's artillery and Dong-Qué "disintegrated under the impact of their high-angle fire", particularly when a French shell found the Viet Minh ammunition depot. As the French tanks approached, the Viet Minh drove the civilians out to clog up the entrance to the village, however as the Viet Minh retreated they were spotted through the civilians by the Moroccan infantry and killed by 13:00. During this battle, however, most of the Regiment 95 personnel who had been elsewhere managed to escape towards the southern end of the French encirclement. Leblanc had realized the intentions of Regiment 95's commander, and had requested one of the two reserve paratroop units to be deployed at the border between the network of temples and the dune-filled area in front of where Group D had originally landed. This paratroop unit, 2nd Battalion of the 1st Colonial Parachute Regiment, began to advance towards the canal at 10:45, 15 minutes before Group B entered Dong-Qué. ...although the operation does not appear to have been successful in all its objectives, 600 Viet Minh soldiers were killed or wounded, and 900 others were captured. 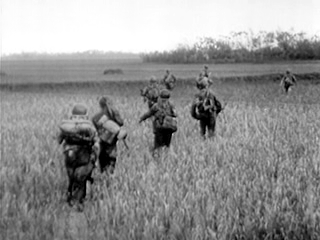 Important stocks of paddy were found, but the number of arms captured was not as great as expected; it is thought that: the Viet Minh soldiers, on finding themselves surrounded, threw their weapons into the rice fields and swamps. 1 2 Windrow (2004), 150. 1 2 3 4 The Times (1953a), 5. 1 2 3 4 Fall, 145. 1 2 3 4 5 Fall, 171. 1 2 3 4 The Times (1953b), 7. 1 2 3 Fall, 151. 1 2 3 Fall, 172. 1 2 3 Chen Jian, 85–87. 1 2 3 Fall, 17. ↑ Flitton, David. "Battlefield Vietnam: Dien Bien Phu, The Legacy". Youtube. PBS. Retrieved 10 August 2015. 1 2 Chen Jian, 91. 1 2 3 Cogan, 61–62. 1 2 3 Chen Jian, 98–99. 1 2 Windrow (2004), 102. 1 2 Windrow (2004), 236. 1 2 3 Fall, 144. 1 2 Windrow (1998), 44. 1 2 3 4 Chaliand, 132. ↑ The Times (1953c), 5. Chen Jian. 1993. "China and the First Indo-China War, 1950–54", The China Quarterly, No. 133. (March 1993), pp. 85–110. London: School of Oriental and African Studies. Cogan, Charles G. 2000. "L'attitude des États-Unis à l'égard de la guerre d'Indochine" in Vaïsse (2000: 51–88).